The book is excellent in every respect. The organization, instructions, and layout of each section and chapter make this manual a quick study and a pleasure to use. I’ve used InDesign from its inception, but Adobe’s manuals are obtuse and plodding, I learned what I absolutely had to, and nowhere near exploited the capabilities and efficiencies of the program. This book changed that within a day. I also much preferred its approach to tutorial style books which lead you through some pretend project, the details of which you may or may not remember when you try to fly solo. 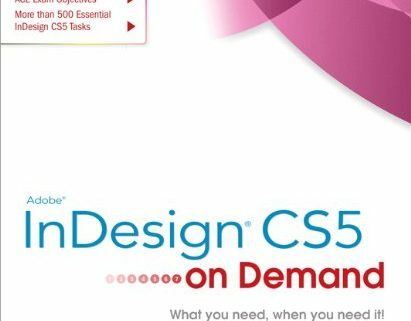 I’m so impressed I junked my accumulated collection of Adobe CS manuals and ordered the versions of this book covering the other CS5 elements. Adobe In Design CS5 is a desktop publishing program that can be used to create labels, certificates, forms, flyers, newsletters, and complete books. The program is very flexible. It allows the user to not only add and manipulate text but also graphics, tables, indexes, links and even animation. The system works by adding individual components together to make a single document. A style sheet can be created to format the parts consistently. You can even create a reusable template. Moreover, the end results can be printed, published to epub format or placed online as a webpage. 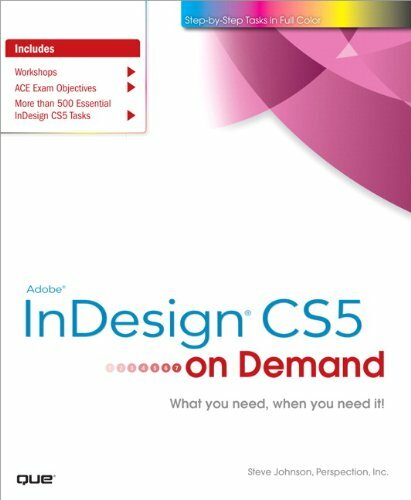 I sure wish I would have read Adobe In Design CS5 on Demand before I started manually creating epub versions of my books. This book does automatically what took me hours to do. Had I started writing the original documents with this program, the work would have been even less.